The sun loses about 6 million tons of mass every second due to nuclear fusion and the solar wind. Despite losing that much material, it has only lost about 0.05% of its original mass over the past 4.5 billion years. 2. Jupiter's Giant Red Spot is expected to disappear within the next 10 to 20 years despite lasting for an estimated 400 years so far. 3. The moon is 1/400th the size of the sun but also 1/400th the distance from Earth which results in the moon and the sun being the same size in the sky, a coincidence not shared by any other known planet-moon combination. 4. Mercury and Venus are the only two planets in our solar system that do not have any moons. 5. Earth is the only known planet where fire can burn. No other planet has enough oxygen. Uranus’ axis is tilted on its side. Its poles experience 42 years of light and 42 years of darkness. 7. Sedna is a dwarf planet with a highly elliptical orbit around sun. It is about three times as far as Neptune from the sun. Scientists hypothesize that it was placed in its orbit by a passing star, as there is no other explanation for its unusual orbit around the sun. 8. Mercury, the closest planet to the sun, has a nighttime temperature of -280°F as it has no atmosphere to retain the 800°F day temperature. 9. Even though the sun won't die for another 5 billion years, humans only have about 1 billion years left on Earth as by then the sun will become hot enough to boil and evaporate our oceans. 10. Pluto is legally a planet in Illinois. Moon is in synchronous rotation with Earth, meaning the same side is always facing the Earth. 12. As of 2018, there are 516,386 numbered minor planets in our solar system, and 5 million more are expected to be found in the next 10 years. 13. Saturn has small orbiting bodies called moonlets which NASA has informally begun to name after kittens. 14. Pluto is one of the five dwarf planets in our solar system, and the name of one dwarf planet is "Makemake." 15. Not all moons are spherical. For example, Saturn has a moon named Pan that is shaped like a ravioli. 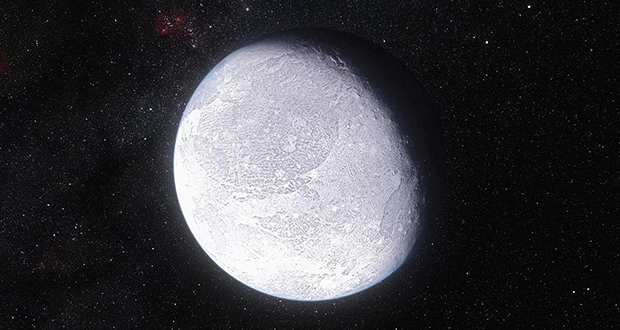 Eris discovered in 2005, is more massive than Pluto and would have qualified as the 10th planet in the solar system until its discovery prompted the International Astronomical Union to formally define 'planet' with a size cutoff that also excluded Pluto. 17. 4 Vesta is a minor planet located in the asteroid belt. It accounts for 9% of the total mass in the asteroid belt and has the tallest mountain in the solar system. Its Rheasilvia impact crater is 19 km (11.8 miles) deep with a central peak 23km (14.3 miles) above the surface of the crater. 18. If Earth stopped spinning suddenly, the atmosphere would still be in motion with the Earth's original 1100 mile per hour rotation speed at the equator. All of the land masses would be scoured clean of anything not attached to bedrock. 19. Uranus and Neptune are not "Gas Giants" as is commonly believed, but belong to a separate category of giant planets called "Ice Giants." This is because less than 20% of their mass is made up of hydrogen and helium. True gas giants like Jupiter and Saturn are over 90% hydrogen and helium. 20. Venus is the second brightest object in the night sky, right after the moon. It is bright enough to be seen in the day, and cast a shadow at night. Phobos orbits Mars fast enough that solar eclipses last about 30 seconds, and there can be two eclipses in a single day. 22. The moon is moving away from earth at about the same rate as a human’s fingernails grow. 23. Planets "emit sounds" by pulsing with radio waves, which can be picked up by radio antennae. The Earth's noise is sometimes referred to as Earth's "chorus" because it sounds a bit like birds chirping. 24. Earth's magnetic poles flip on average every 200,000 - 300,000 years. It flipped 780,000 years ago. 25. There is a non-spherical, egg-shaped dwarf planet orbiting the Sun in our Solar System named Haumea. It is approximately 1/3 the size of Pluto.